The history of gun powder tea can be dated back to 1000 years ago. It originated from Zhejiang Province. 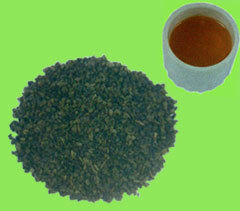 Gun powder tea is one of earliest commodity exported in China. In 18th century, gun powder tea as Gongxi Tea was world-famous and it’s quite expensive in market, even more expensive than pearl, so it’s hailed as Green Pearl. It is like a ball and assuming gun powder so it’s called gun powder tea. Generally speaking, it’s emerald green like a green pearl. With a strong fragrance, it’s suitable for stewing for long time. Veneer case or kraft case with a aluminum paper. The cases are packed by gunny bag or poly woven bag and then banded by PE tape.